About: This garden has a great variety of plants, including different textures, scents and colors. 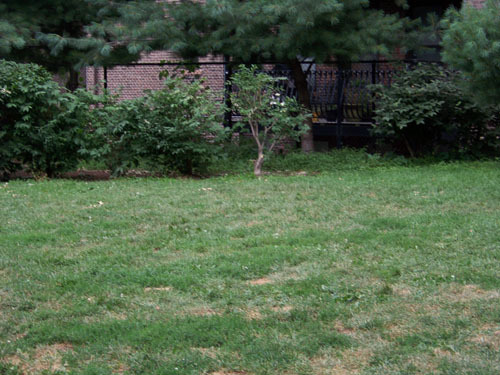 A focal point at the end of the garden is a weeping cherry planted in honor of a previous volunteer`s mother. Most recent additions to the garden include lavender, thyme, rue and other herbs, as well as succulent plants that do well in this dry and sunny location. About: Near Harcourt and West Canton Streets, Near Back Bay Station. 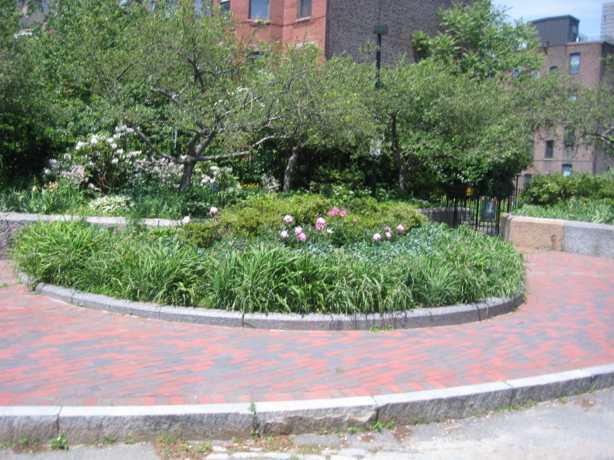 About: Roses in the Southwest Corridor Park rose garden are complemented by perennials, bulbs, vinca, and a Japanese maple. About: Near Follen St., between Mass. Ave. and Back Bay. 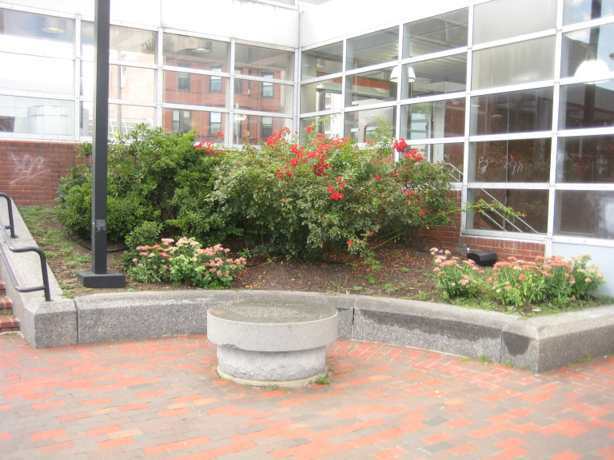 About: This corner is a popular and pleasant spot for sitting because of the round stone with commemorative quote. Volunteers weed, prune, and water the rambling rose, azaleas, and rhododendrons, and have also planted bulbs and sedum. About: Near Braddock Park, between Mass. Ave. and Back Bay. 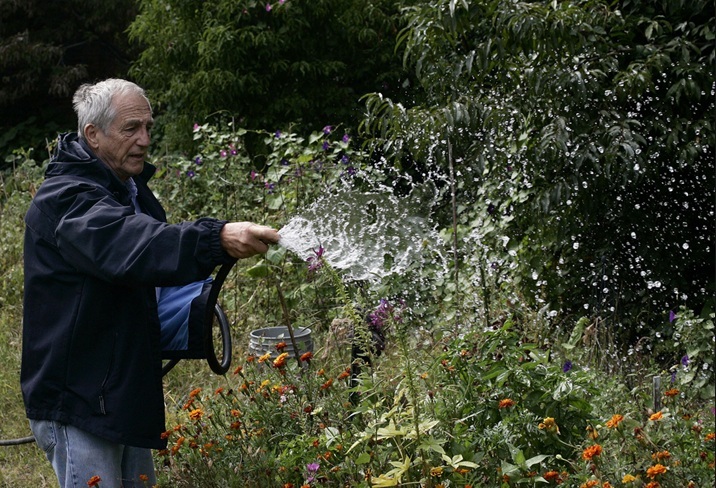 About: In the summer of 2008, this space was transformed into a flower-bursting sanctuary for butterflies, bees and birds. The plants in the garden specicially support the lifecycle of 5 specific city tolerant butterflies: the Monarch, Cabbage White, Red Admiral, Painted Lady, Clouded Sulpher and Black Swallowtail. A sign board in the garden announces recent butterfly sightings as well as provides fun facts about butterflies. 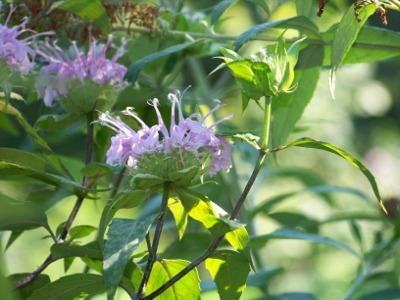 The wildflowers include: butterfly bush, milkweed, cosmos, Queen Annes lace and other native plants. The pieces of old wood in the garden provides shelter for butterflies. 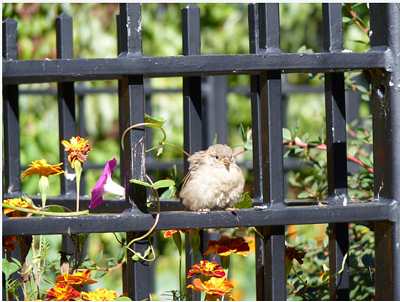 About: Near Greenwich Park, between Mass. Ave. and Back Bay. About: This garden section is the original butterfly garden, and includes a variety of wildflowers, including butterfly bush and milkweed, that attract butterflies. About: Near Mass. 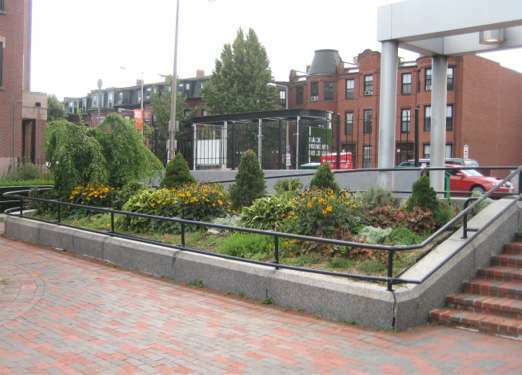 Ave. Station, across from Claremont St.
About: This section is named the "potting garden" because of the use of planters and a potting table as garden elements. The garden is designed like a cottage garden, with edible gardening (herbs, strawberries, raspberries and squash) mixed in with native flowers. Holly and eunonymous shrubs form the backdrop for this garden. 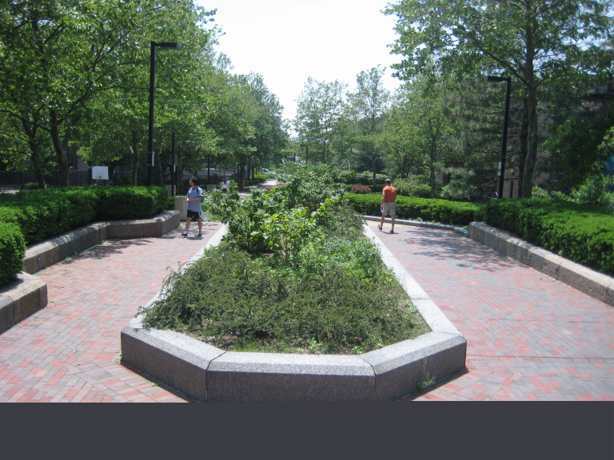 About: This area has two raised beds with one at the Wellington Street level and the other up a short flight of stairs. 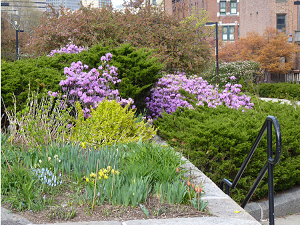 The garden features three magnolia trees and seasonal blossoms that are a highlight of the view as you enter the park from Mass Ave.
About: Near Mass. 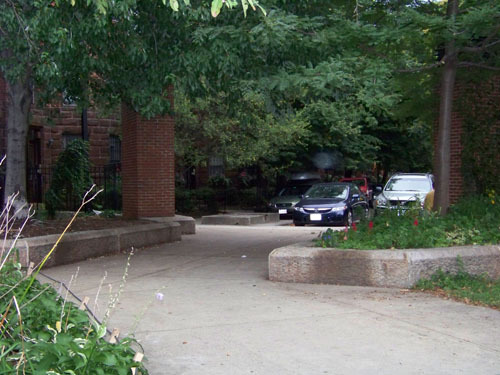 Ave. Station, Carter School and Carter Playground. About: The Claremont Green is bookended by two large plantings of viburnum, with two young Alberta Spruce in the middle. Three large spirea frame the back edge of the lawn, along with two Hanoki Cypress, some ornamental grasses, a golden rain tree, a tree lilac and a half-oblong grassy area. About: The Blackwood Green is a lawn hedged by a series of shrubs, beginning with holly, then rhodys, and finally junipers. A mock orange tree stands behind the holly, with forsythia and viburnum planted towards the east end of the garden area. 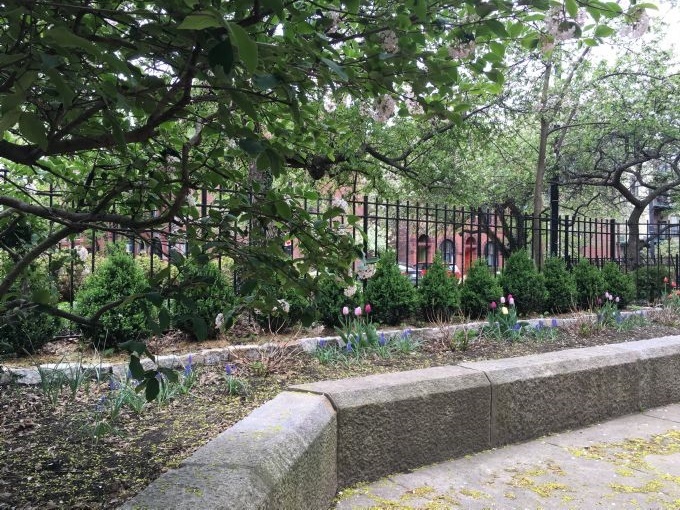 About: The Southwest Corridor Park includes the mini-park at the end of the Blackwood Street, a cool spot with dogwood, boxwood, spring flowering bulbs and other plantings. About: Claremont Island sits next to Claremont Inlet, where you can walk around an oblong bed featuring a theme of purple flowers. 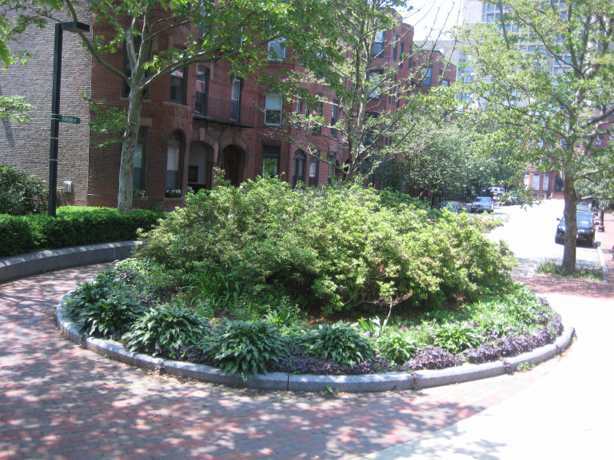 About: At the Round Window Lawn, a mix of trees and shrubs form a half circle around a grass carpet. The paper birch, yew, and rhododendron look good year round, while the forsythia and barberry shine brightest in the summer. Coryopteris and lilacs provide color. About: The hardscape defines Greenwich Park Terrace with a large granite step-up from the garden area in front with sedum autumn joy and azaleas, to the wooded area behind. The top terrace features six crab apple trees and three holly bushes, with an assortment of azaleas and hosta closer to the ground. About: This oval island near the tennis courts looks different in every season. Tall sunflowers are a focal point all summer. 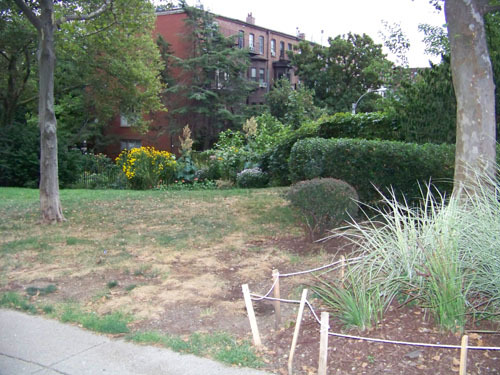 About: This was recently re-seeded with new grass. It has a beautiful sambucus, which complements the pine trees. About: This area has color and texture throughout the spring, summer and fall, with a variety of plantings. This area will be renovated and updated in the next few years once design is aligned. 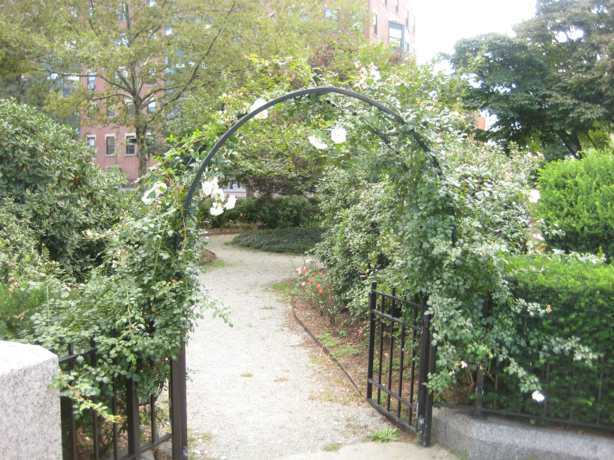 About: This grassy area is softened by tall flowers, roses and shrubs that line the fence. The upper part of the swale is shaded by a pine and bordered by hedges. About: Two Red Bud trees rise out of W. Rutland Circle next to Titus Sparrow Park. 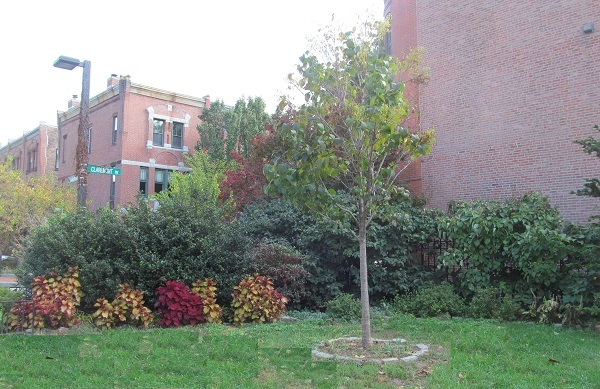 The trees are interplanted with Barberry shrubs, vinca and wild strawberry. New plantings were added in Fall 2010 by the volunteers from the Schweitzer Fellowship Program. 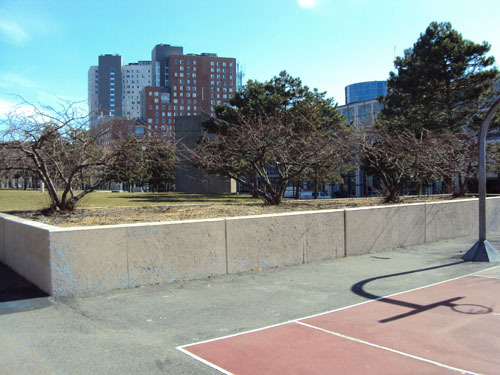 About: The Basketball Green is the patch of lawn situated above the court and Titus Sparrow Park. 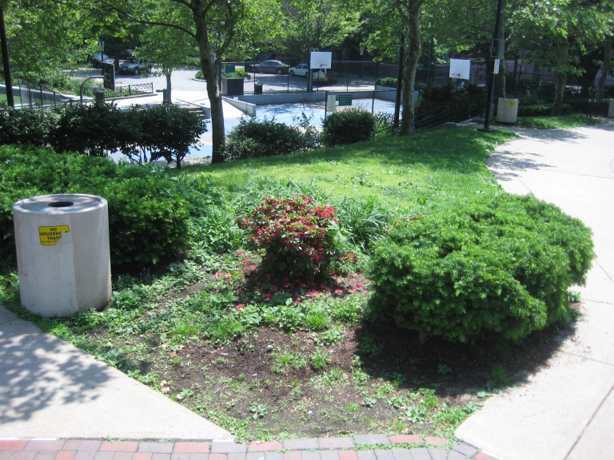 It is planted with holly, juniper, viburnum shrubs and new roses. About: The Tennis Corner had a fence installed the spring of 2009 and tthe garden is now planted with impatiens, violas, violets and vinca -- all happy in the shade. About: This large island-planter contains a host of wonderful species that provide color and fragrance for most months of the year! Beginning in January passersby can enjoy the rare copper-flowered variety of Witch Hazel that is also mildly fragrant. In February, small white Snow Drops begin to push their way through the semi-frozen soil. 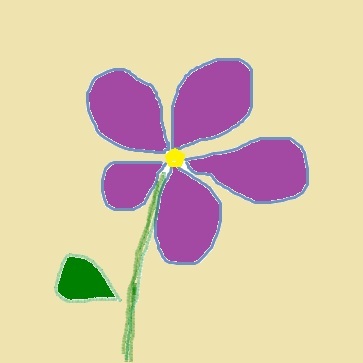 March ushers in English Bluebells and Purple Crocus with the first splash of color. A sea of orange defines April in the form of Orange Princess, Orange Toronto, Day Dream and Veronique Sanson Tulips. May brings deep pink Virichic Tulips and deep blue Parrot and Diamond Tulips along with creamy white Double Poets Narcissus. Pachysandra provide a constant green backdrop for the various waves of color, and Cotoneaster keeps passersby in the holiday spirit with persistent red berries and green leaves. About: Two raised beds on either side of the path. 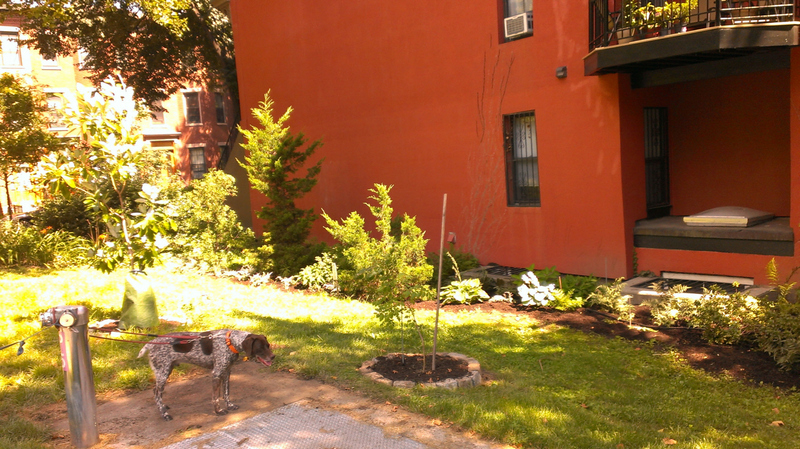 Planted with hemlocks, a crab apple, a large batch of junipers and rhodys. Last year the marigolds along the path were a SWCP highlight. About: This gently sloping hill has been planted and pruned on several volunteer afternoons. About: Planting at the bottom of the hill provide bright color along this grassy side of the park. About: A triangular granite framed island with 3 crab apples alongside perennials. 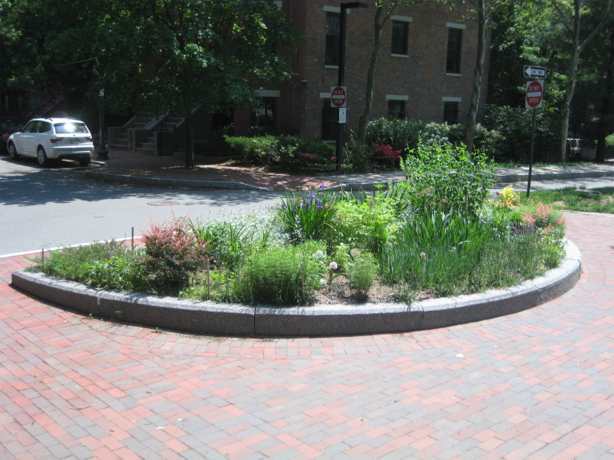 About: Two small garden areas framing the entrance to the community garden features a beautiful hawthorne, dogwood, and crab apple trees planted underneath with annuals, azaleas, and a bed of hostas. 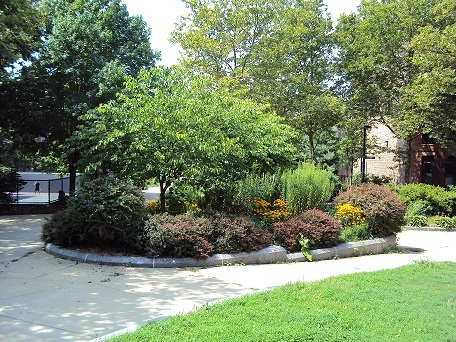 About: Groundcovers and shrubs complement the crab apple tree, gate and fencing in the area outside the community garden. 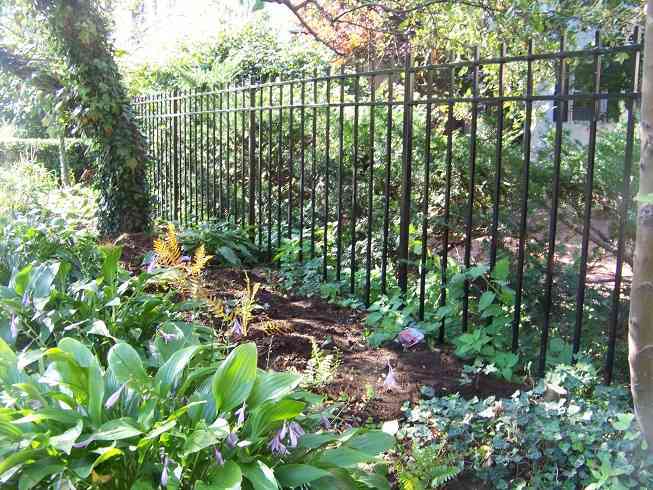 Volunteer(s): Greg S., Patricia S.
About: A low iron fence frames a holly, boxwood, rhody, and cotoneaster border. About: Enjoy the new plants at this busy corner near the playground. 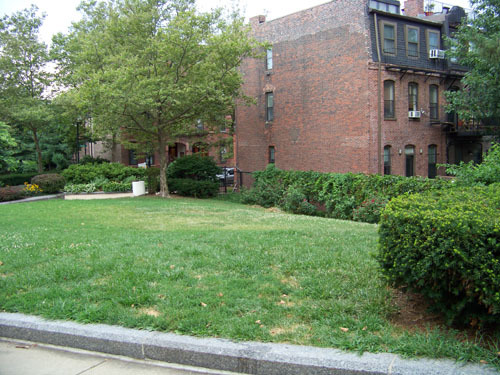 About: This garden area lines the playground and dog park along the sidewalk. About: A round granite circle loaded with azalea and hydrangea, Tiger Eye Sumac, thalictrum, acanthus, lilies and mums. About: Washington-Rutland community gardeners donated bearded iris (a tall light purple variety and a short yellow variety), cosmos and columbine. Other plants came from commercial and native-plant nurseries as well as from gardening friends perennials that needed dividing. 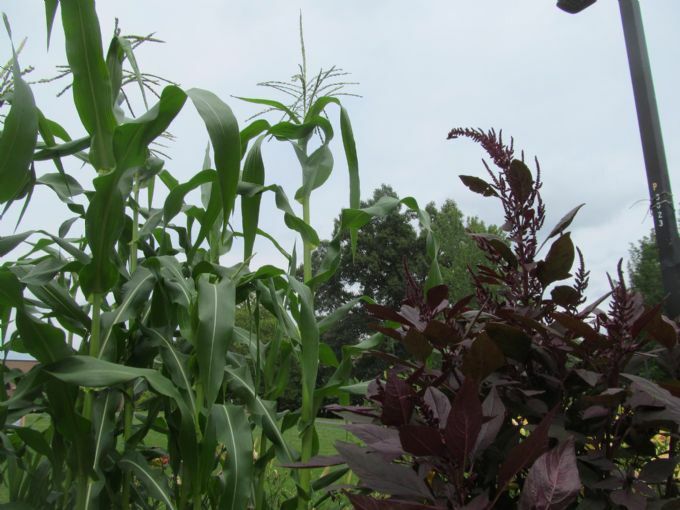 The planter now sports wave upon wave of purple and yellow blooms of different heights and textures. Daffodils and grape hyacinths wake the garden in the early spring, continuing with bearded & Japanese iris in May. Cranesbill geranium, false indigo, veronica and salvia emerge in June, followed by coreopsis, balloon flower and lemon lily. Russian sage and reblooming of salvia and pincushion flower endure the heat of summer until magenta and light pink cosmos take off. Aster flowering signals the coming of fall. 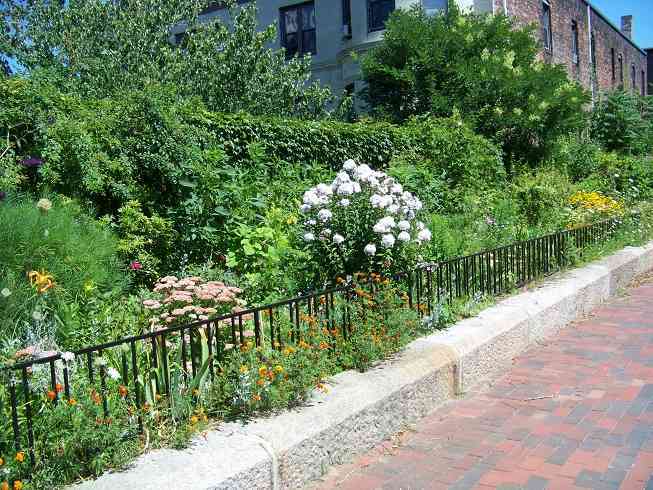 About: This garden borders the tot lot with a row of perennials. 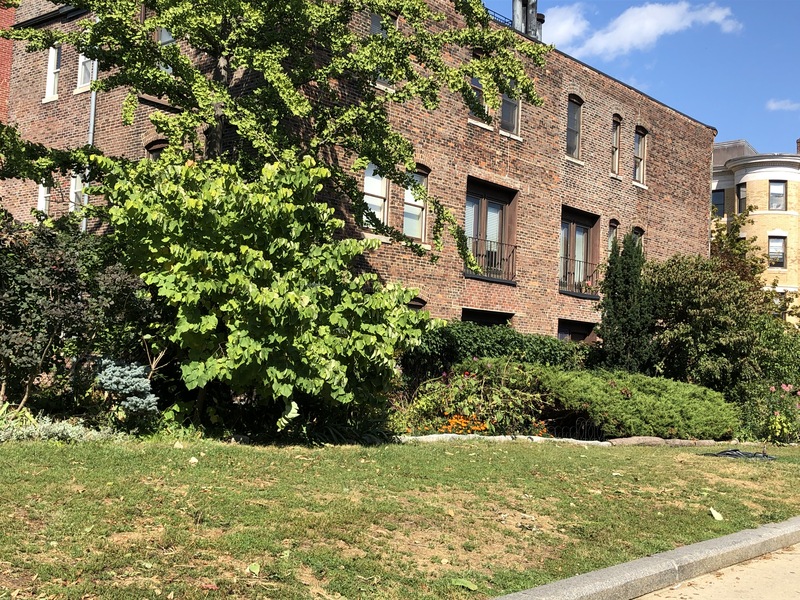 Volunteer(s): Carol K., Bob K.
About: This recently restored garden overlooks Carleton Court Dog Park and incorporates a weaving pea stone path to a sitting area under two mature dog woods. 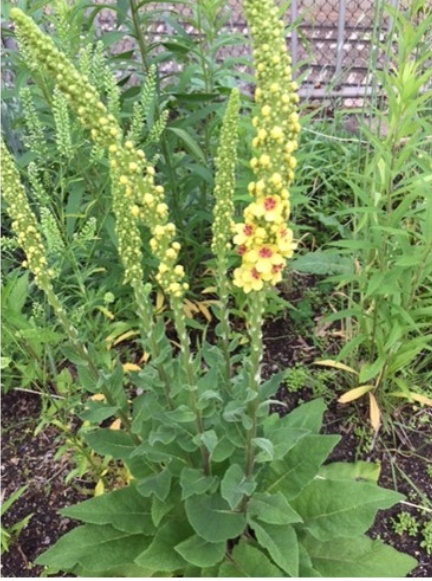 This perennial garden contains many species of plants and flowers that bring interesting leaf textures, different flowering times, and varying foliage colors many months of the year. About: A stand of 3 linden trees soars above a stand of rhodys, azaleas hostas, Japanese Anemone, and Ligularia. About: Several volunteer days have focused on work in this area, which has a variety of shade plants. About: Adjacent to the Southwest Corridor Park, the Carter School, a BPS school for students with disabilities, has a Sensory Garden that engages all five senses: sight, sound, touch, smell and taste. 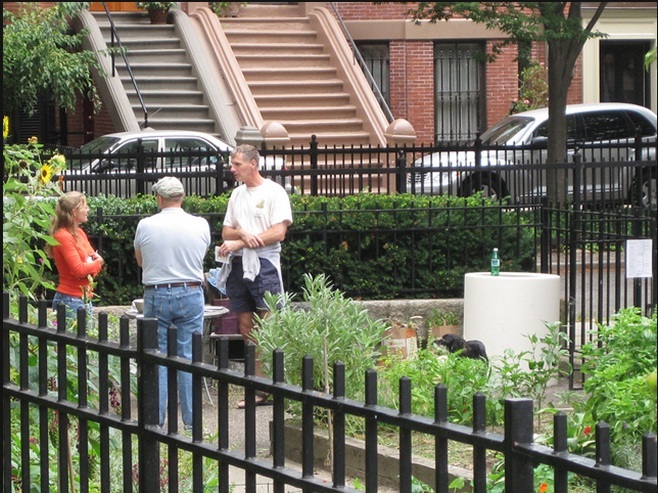 The garden is fenced in for use by the students, and open occasionally such as during South End Garden Tours. 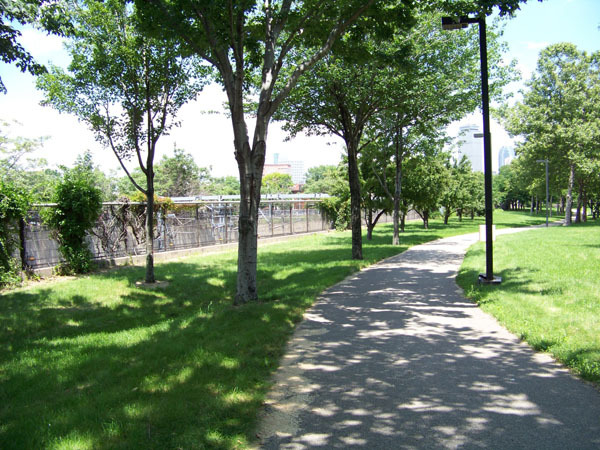 About: The Pierre Lallemont Bicycle Path (Southwest Corridor Bicycle Path) provides separate pathways marked for bikes and pedestrians all along the length of the corridor from Mass. Ave., the official beginning of the bike path, through Forest Hills. About: DCR SWCP Headquarters building at 38 New Heath Street. 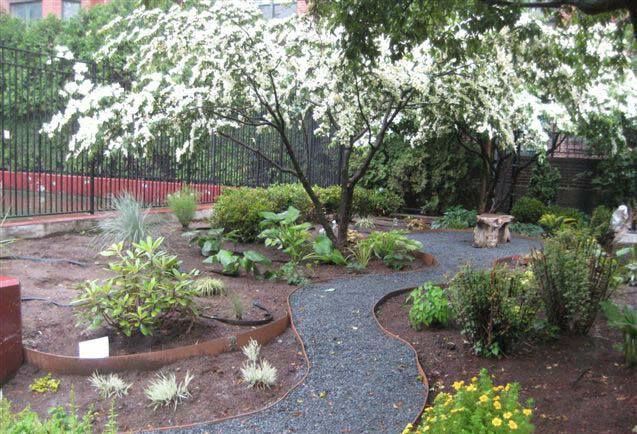 About: This children`s garden is in a raised garden bed next to the playground and amphitheatre. 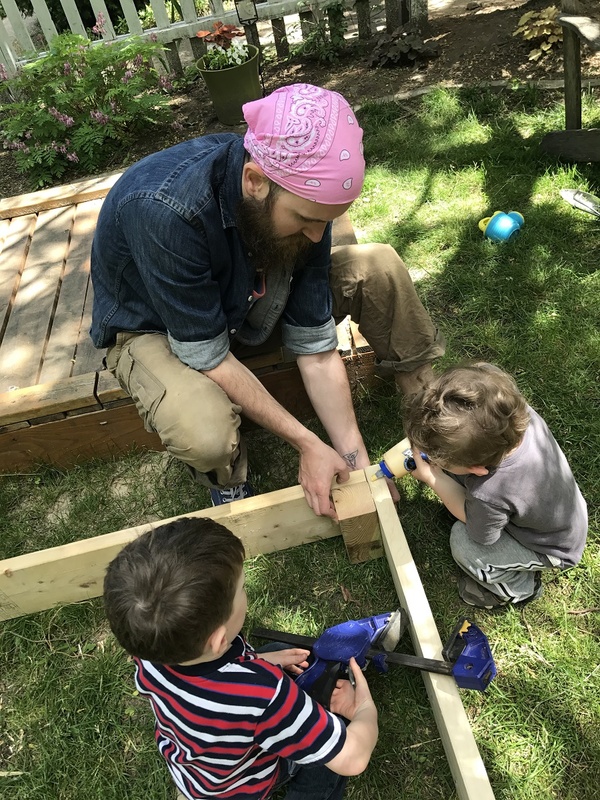 Through the Southwest Corridor Park Conservancy and the RealKidz program at Bromley Heath Apartments, children work in the garden throughout the spring, summer and fall. Plants include edibles such as peas, parsley, mint, borage and strawberries, as well as a variety of flowers and other vegetables. Cobblestones and flagstones create a path for walking around the main garden, which features two crab apple trees. About: Raised bed gardens in the Mission Deck are often planted and mulched by youth programs during the summer. 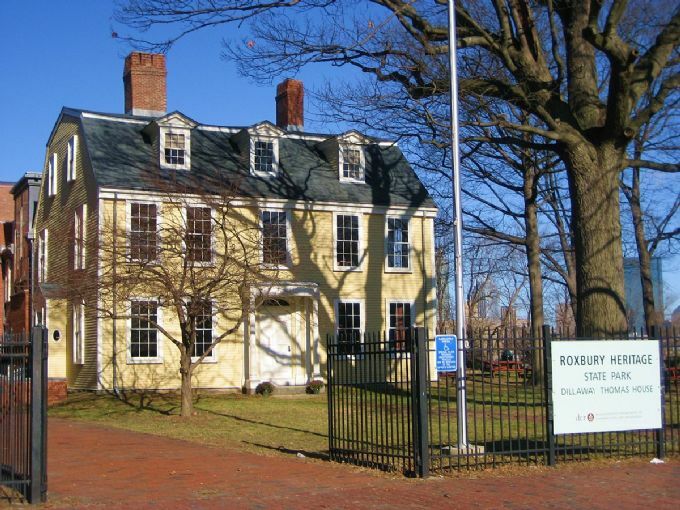 About: The Roxbury State Heritage Park is a DCR-managed state park that celebrates the heritage of the community of Roxbury (featured on this map as a neighboring park that is supported by DCR SWCP staff). 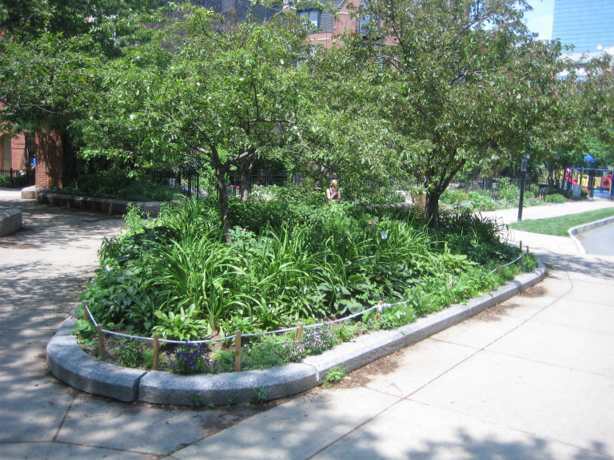 About: Northampton Green is between Mass Avenue and Northampton Street near the Sensory Garden. The path winds down a hill from the MBTA station toward Northampton Street, passing by three stone obelisks that were part of the poetry and prose installations that marked the park opening. 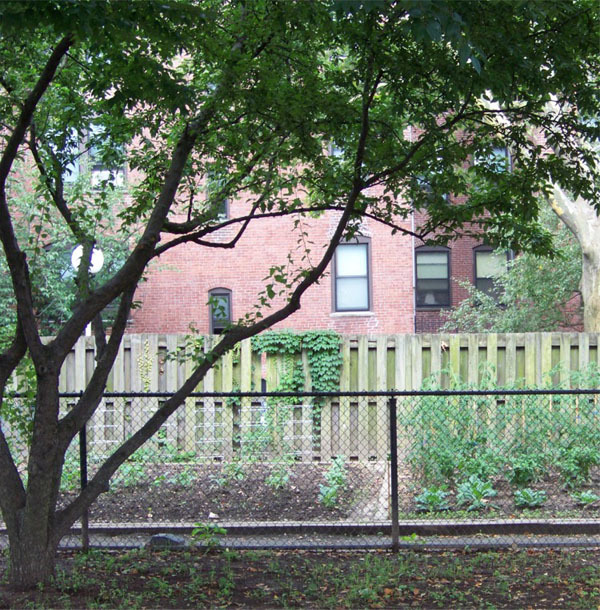 Over the fence, the Carter School Sensory Garden is visible. 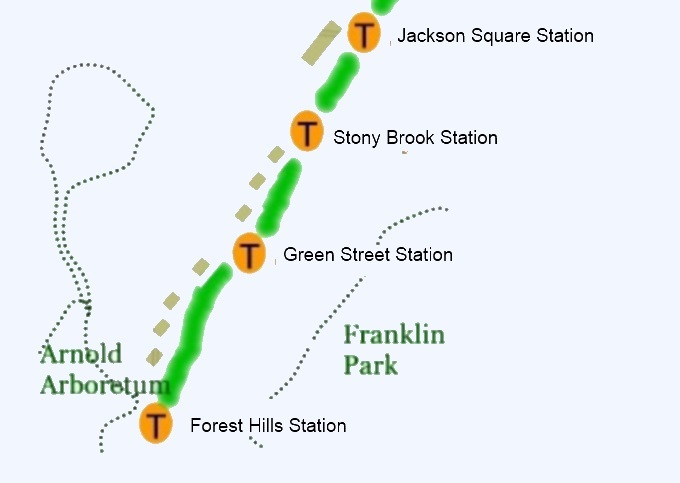 This area will be updated over the years 2018 and 2019. 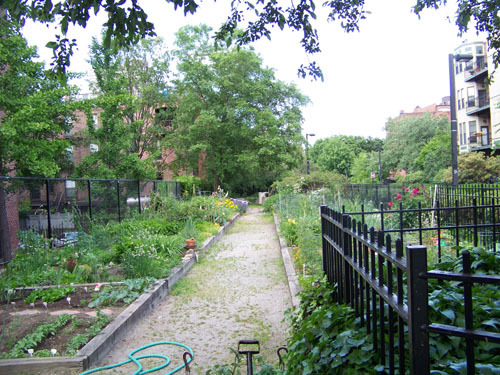 About: Community Garden near Northampton St. and Camden St.
About: Section 3 of the Corridor spans from Jackson Square Station to Stony Brook to Green Street to Forest Hills Station. 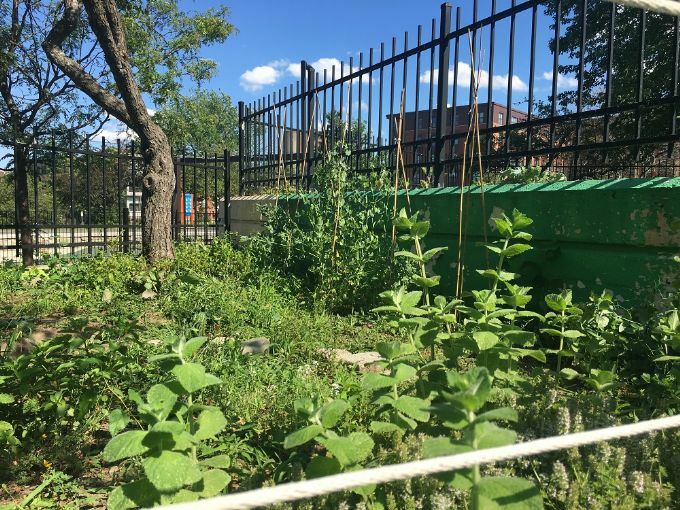 Section 3 has several community gardens and playgrounds, and also provides access to many other parks, including easy access by walking or bicycle to the Arnold Arboreteum and Franklin Park. About: Garden in the New Minton Playground -- designed for participation by children and families. 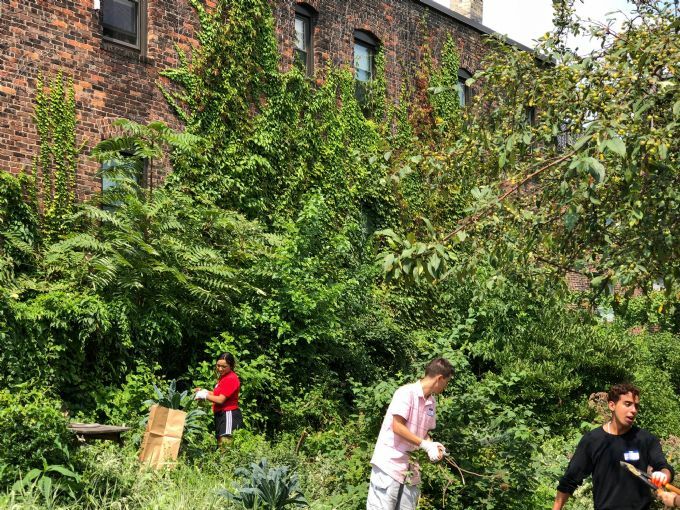 About: Volunteers from JP have adopted a SWCP garden near Stony Brook, with a theme of edible landscaping, with expectations of produce to share among neighbors. 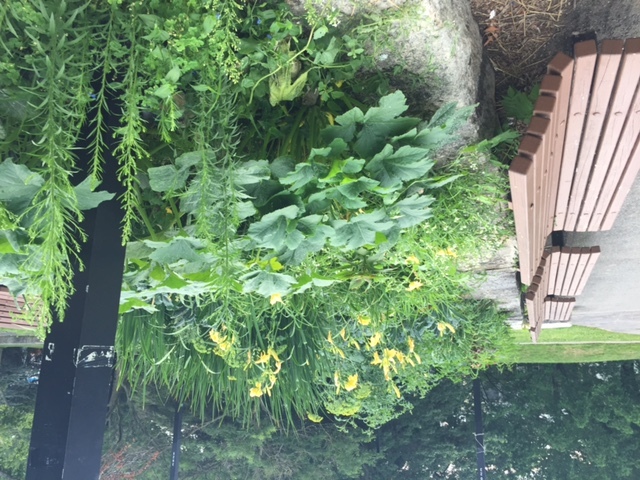 Visit the Google Group for this garden at https://sites.google.com/site/festivalgardenjp/ or email festivalgardenjp@gmail.com for more information and to find out how to volunteer and to join the garden Google Group/email list. About: Flower Patch on path to Amory St.